03/06/2019: Added Wilde 1725-B Open-End Wrench. 02/10/2019: Added 1929 C.W. Marwedel catalog reference. 01/27/2019: Added catalog listing from 1924. 11/27/2015: Added examples of Craftsman wrenches made by Wilde. 11/17/2015: Added a 1922 notice of incorporation. 12/10/2011: Added Sexauer 8 Inch Angle-Nose Pliers. 09/29/2010: Added a Wilde 127 Box-End Wrench. 06/21/2010: Added Wilde 402 6 Inch Diagonal Cutters. 05/24/2010: Added a Wilde 129 Box-End Wrench. 08/28/2009: Moved to separate page. 07/24/2009: Added Wilde 8 Inch Wrench Pliers. 10/09/2007: Added a Wilde 1720 Ignition Wrench. 09/19/2007: Added Craftsman Rope-Banded Snap-Ring Pliers. 06/10/2007: Added Craftsman Combination Pliers. 09/08/2006: Added Wilde Early Wrench Pliers. 05/17/2006: Added Wilde Wrench Pliers. 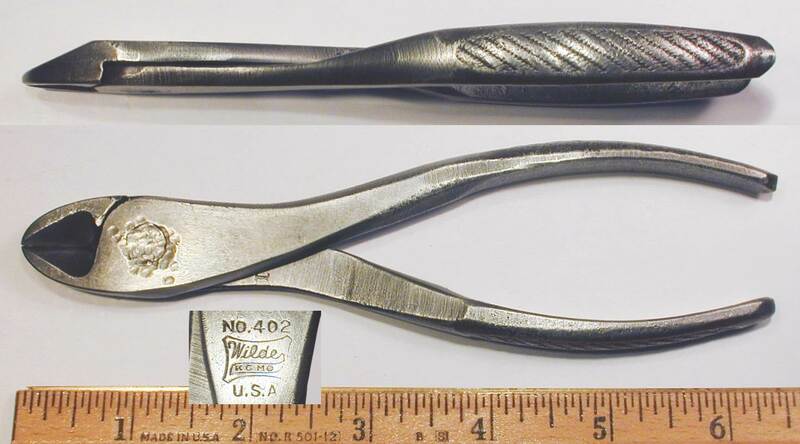 The Wilde Tool Company is a maker of pliers and other tools operating in Hiawatha, Kansas. Wilde Tool began operations in 1922 as the Wilde Drop Forge and Tool Company in Kansas City, Missouri. The notice of incorporation at the left was published on page 595 of the October 12, 1922 issue of American Machinist and notes the company's capital stock as $50,000, with the incorporators listed as Mary Wilde, Goldie Wilde, and Paul Froeschl. Another source from 1922 gave the company's address as 2936-40 Fairmount Avenue, and noted their products as pliers, tools, and drop forgings. In 1927 the company was purchased by brothers Otto and Paul Froeschl. 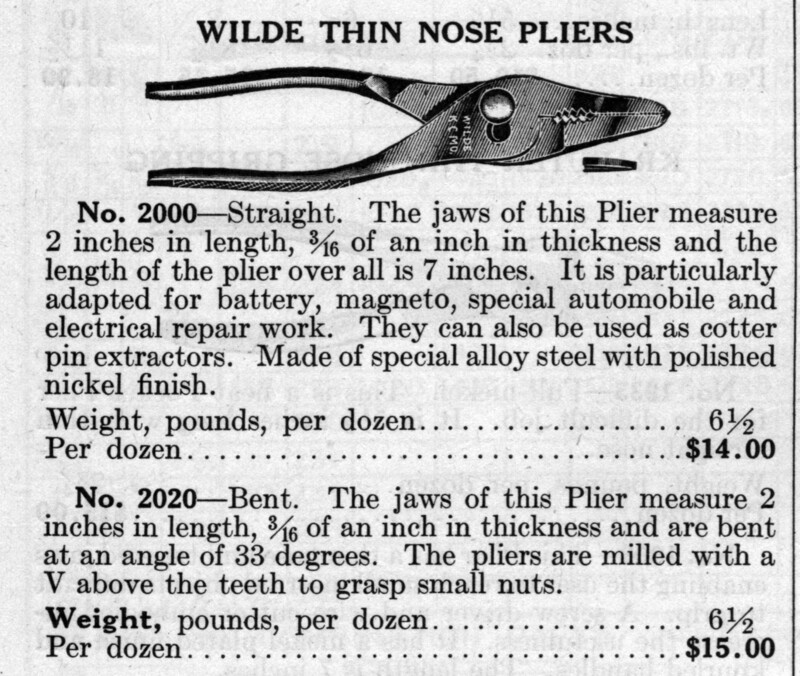 1924 Catalog Listing for Wilde Thin-Nose Pliers. The scan at the left, from the 1924 Waterhouse & Lester catalog No. 20, shows an example of the company's early products. 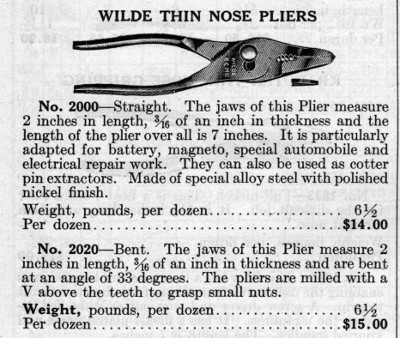 The catalog listing describes two models of Wilde's thin-nose pliers, No. 2000 with straight jaws and No. 2020 with bent jaws. The description notes the use of "special alloy steel" and a polished nickel finish. This catalog listing is significant, as it shows that the company was able to have its products carried by industrial distributors soon after the company was founded. One of the company's best-known early products was the line of angle-nose gripping pliers based on patent #1,800,447, filed by Otto Froeschl in 1928. These pliers were sold under the trade name "Wilde Wrench" and became very popular. From early on Wilde adopted a distinctive "rope-banded" gripping pattern for its plier handles. This handle pattern is often helpful in identification of Wilde contract production, as no other plier maker is known to have used this type of pattern. Our earliest reference for this handle pattern is the 1929 C.W. Marwedel catalog, which shows No. 2020 bent thin-nose pliers with "rope-banded" handles. In the mid 1930s Wilde began producing tools for the Sears Craftsman line. The earliest tools supplied were battery pliers, but later production included a variety of plier models, and during the mid 1940s Wilde even produced various types of Craftsman wrenches. Although Wilde Tool is best known today for its pliers, during the 1930s and 1940s the company offered a full line of service tools, including wrenches, sockets and drive tools, chisels and punches, automotive specialty tools, and even auto body tools. In 1955 the company moved to its present location in Hiawatha, Kansas and changed its name to Wilde Tool, Incorporated. Wilde Tool continues in operation today under management by later generations of the Froeschl family, and further information can be found on the company's website at www.wildetool.com [External Link]. We have several catalogs for Wilde Tool, as summarized in the table below. No. 41 1941 Full Full line of sockets and drive tools. Full line of wrenches. No. 58 1958 Full No sockets or drive tools. Wrench selection limited to ignition wrenches. Wilde tools were available from a number of automotive and industrial supply catalogs, and some examples of these publications are listed below. Waterhouse & Lester 1924. The 1924 catalog No. 20 from Waterhouse & Lester lists two models of Wilde thin-nose pliers on page 378. C.W. Marwedel 1929. The 1929 catalog No. 12 from C.W. Marwedel lists three models of Wilde pliers on page 160. The models shown are Nos. 2000, 2010, and 2020, and the illustration of the No. 2020 "Bent Thin Nose Pliers" shows the "Rope-Banded" pattern on the handles, with "Alloy Steel" on the underside. Fig. 1. Wilde Early 7 Inch Wrench Pliers, with Insets for Handle Pattern and Detail, ca. 1928-1931. Fig. 1 shows a pair of Wilde wrench pliers marked "Wilde Wrench 7" and "Pat. Pend. ", with "KC MO" in the Wilde logo. The underside of each handle also has a forged-in marking "Alloy Steel", as shown in the lower inset. The overall length is 7.2 inches. The finish was originally nickel plating, but has now worn to bare steel in most areas. The patent pending notation refers to patent #1,800,447, filed by Otto Froeschl in 1928 and issued in 1931. Based on the filing date, these pliers were likely made in 1928-1931. 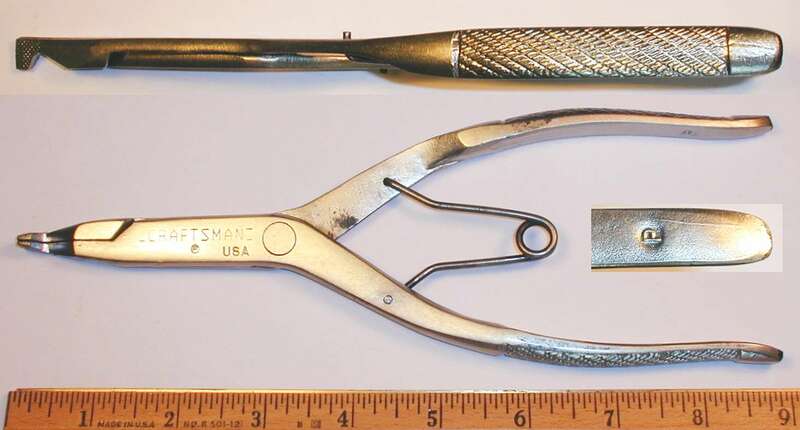 These early pliers use a slip-joint mechanism with two positions, but the later models were made with three positions. Fig. 2. Wilde 8 Inch Wrench Pliers, with Insets for Side View and Marking Detail, ca. 1930s to 1940s. Fig. 2 shows a pair of Wilde 8 inch wrench pliers, stamped with the Wilde "KC MO" logo and "Wilde Wrench", and with a "Pat. No. 1800447" patent notice. The underside of each handle also has a forged-in marking "Alloy Steel", shown as a close-up in the lower inset. The overall length is 8.3 inches. and the finish is cadmium plating. The patent notice refers to patent #1,800,447, issued to Otto Froeschl in 1931. Fig. 3. Wilde 6 Inch Wrench Pliers, with Inset for Handle Pattern. Fig. 3 shows a later version of the Wilde wrench pliers, marked "Wilde Wrench 6" and "Pat. No. 1800477". The overall length is 6.2 inches. Fig. 4. Wilde 402 6 Inch Diagonal Cutters, with Insets for Side View and Reverse Detail. Fig. 4 shows a pair of Wilde 402 6 inch diagonal cutters, stamped with the "Wilde KC MO" logo and "U.S.A." on the reverse. The top inset shows a side view of the pliers, illustrating the finely detailed rope-banded gripping pattern on the handles. Fig. 5. Wilde No. 410 Battery Pliers, with Inset for Handle Pattern. Fig. 5 shows a pair of Wilde No. 410 battery pliers, stamped with the Wilde logo and "K.C. Mo." near the pivot. The overall length is 7.7 inches. The inset shows the distinctive rope-banded gripping pattern used by Wilde for most of their plier production. 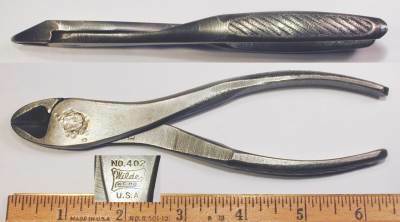 A very similar pair of pliers made by Wilde for the Sears Craftsman brand can be seen as the Craftsman Battery Pliers with Rope-Banded Pattern. In addition to pliers, Wilde also produced a full line of wrenches and socket tools during the 1930s and 1940s. The box-end and combination wrenches from this period were made in a style with markings forged into depressed panels, with small panels for the opening sizes. Fig. 6. Wilde 1725-B 1/2x9/16 Open-End Wrench, with Inset for Reverse, ca. Early to Mid 1930s. Fig. 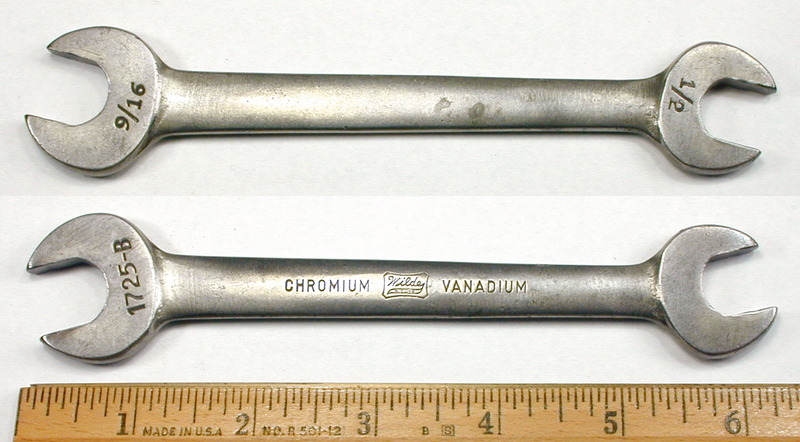 6 shows a Wilde 1725-B 1/2x9/16 open-end wrench, stamped "Chromium Vanadium" with the Wilde logo on the shank, with the fractional sizes on the reverse faces. The overall length is 6.1 inches, and the finish is polished steel, with possible traces of nickel plating. 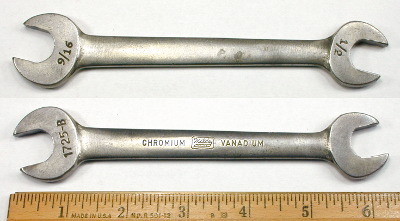 The "Chromium Vanadium" marking strongly suggests that this wrench was made as contract production for Western Auto Supply, which began using "Chromium Vanadium" as a brand in the early 1930s. The next two figures shows examples of Wilde's box-end wrenches. Fig. 7A. Wilde 127 13/16x7/8 Box-End Wrench, with Insets for Side View and Reverse Detail, ca. 1930s-1940s. Fig. 7B. Wilde 129 15/16x1 Box-End Wrench, with Insets for Side View and Reverse Detail, ca. 1930s-1940s. The overall length is 15.0 inches, and the finish is chrome plating. Fig. 8. Wilde 195 3/4 Combination Wrench, with Insets for Side View and Reverse Detail, ca. Mid 1930s-1940s. Fig. 8 shows a Wilde 195 3/4 combination wrench, marked with "Wilde K.C. Mo." and the fractional sizes forged into the shank, with "Chrome Vanadium Steel" and the fractional sizes forged into the reverse. The overall length is 7.6 inches. The finish appears to be nickel plating, with extensive losses due to wear. Fig. 9. Wilde 1720 9/32x11/32 Ignition Wrench. Fig. 9 at the left shows a Wilde 1720 9/32x11/32 ignition wrench, marked with the company name, model, and fractional sizes. The overall length is 3.5 inches, and the finish is black oxide. Wilde production for Craftsman was generally marked with a "P" in a circle as a manufacturer's code, and this code can be used to identify items made by Wilde when the typical rope-banded gripping pattern is not in use. 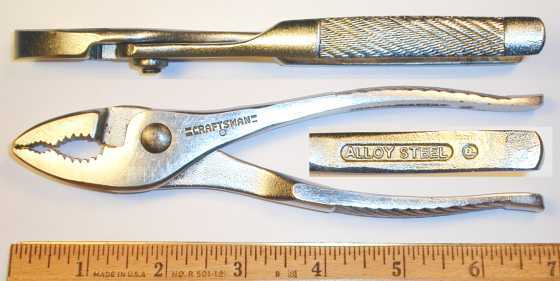 The next several figures show examples of Craftsman pliers with the rope banding pattern on the handles, all presumed to be contract production by Wilde. Fig. 10. Craftsman 11 Inch Waterpump Pliers, with Inset for Handle Pattern, ca. 1960s. Fig. 10 shows a recent pair of Craftsman 11 inch waterpump pliers with a rope-banded gripping pattern. The handles of these pliers have a forged-in "P" code on the inside, identified as the manufacturer's code for Wilde. The overall length is 10.8 inches. The pliers are marked with the Craftsman double-line logo, but no model number is marked. Model numbers were generally marked on Craftsman tools after the late 1960s to early 70s, so these pliers were probably made in the 1960s. Fig. 11. Craftsman 10 Inch Tongue-and-Groove Waterpump Pliers, with Insets for Handle and "P" Code, ca. 1960-1969. Fig. 11 shows a pair of Craftsman 10 inch tongue-and-groove waterpump pliers with a rope-banded gripping pattern, marked with the Craftsman double-line logo, but without a model number. The left inset shows the forged-in "P" code on the inside of the handles, the Craftsman manufacturer's code for Wilde. The tongue-and-groove design dates back to the classic 1934 patent #1,950,362 by the Champion DeArment (now Channellock) company. Fig. 12. Craftsman 6.5 Inch Slip-Joint Combination Pliers, with Insets for Side View and Marking Detail. Fig. 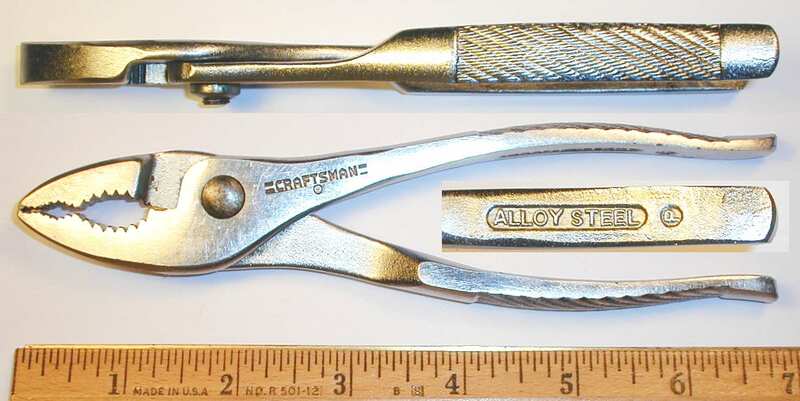 12 shows a pair of Craftsman slip-joint combination pliers with the rope banding pattern, stamped with the double-line logo and a small "P" code near the pivot, and with "Alloy Steel" forged into the underside of the handles. The overall length is 6.7 inches, and the finish is chrome plating. The lower inset shows the forged-in "P" code on the inside of the handles, the manufacturer's code for Wilde. Fig. 13. Craftsman Snap-Ring Pliers, with Insets for Side View and Marking Detail. Fig. 13 at the left shows a pair of Craftsman snap-ring specialty pliers with rope-banded handles, stamped with the Craftsman double-line logo and "USA", and with a small "P" in a circle code. Although relatively rare, Wilde also produced wrenches for the Craftsman line. The next several figures show examples of wrenches in the modern raised-panel style, but marked with a "P-Circle" manufacturer's code rather than the more common "V" code. Fig. 14. Craftsman "P-Circle" 19/32x25/32 Offset Box Wrench, with Insets for Side View and Reverse Detail, ca. 1945. Fig. 14 shows a Craftsman 19/32x25/32 offset box wrench, stamped with the Craftsman double-line logo on the raised panel, and with a P-Circle mark forged into the shank. The reverse is stamped "Forged in U.S.A." on the panel with an "N4" code forged into the shank. The overall length is 10.4 inches, and the finish is plain steel with traces of cadmium plating. Fig. 15. Craftsman "P-Circle" 5/8x3/4 Offset Box Wrench, with Insets for Side View and Reverse Detail, ca. 1945. Fig. 15 shows a Craftsman 5/8x3/4 offset box wrench, stamped with the Craftsman double-line logo on the raised panel, and with a P-Circle mark forged into the shank. The reverse is stamped "Forged in U.S.A." with a "2" forged into the shank. Fig. 16. Craftsman "P-Circle" 3/8x7/16 Open-End Wrench, with Inset for Reverse Detail, ca. 1945. Fig. 16 shows a Craftsman 3/8x7/16 open-end wrench, stamped with the Craftsman double-line logo on the raised panel, with "Forged in U.S.A." on the reverse panel. The reverse is also marked with an "N4" code and a P-Circle mark forged into the shank. Fig. 17. Craftsman "P-Circle" 5/8x3/4 Open-End Wrench, with Inset for Reverse, ca. 1945. Fig. 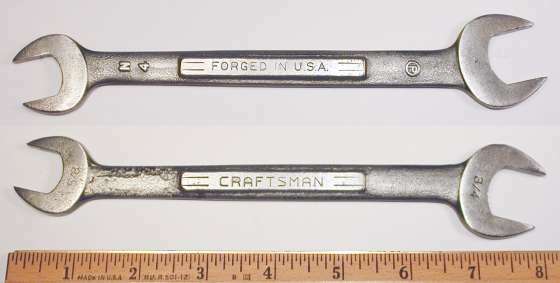 17 shows a Craftsman 5/8x3/4 open-end wrench with raised panels, stamped with the Craftsman double-line logo on the front panel, with "Forged in U.S.A." on the reverse panel. The reverse is also marked with an "N4" code and a P-Circle mark forged into the shank. Fig. 18. Craftsman "P-Circle" 25/32x13/16 Open-End Wrench, with Inset for Reverse Detail, ca. 1945. Fig. 18 shows a Craftsman 25/32x13/16 open-end wrench with raised panels, stamped with the Craftsman double-line logo on the front panel, with "Forged in U.S.A." on the reverse panel. The reverse is also marked with an "E3" code and a P-Circle mark forged into the shank. The overall length is 8.5 inches, and the finish is cadmium (or possibly zinc) plating. Wilde Tool produced pliers for the "Sexauer" brand, which is believed to refer to the JA Sexauer Manufacturing Company, a maker of plumbing supplies and repair parts. The JA Sexauer Manufacturing Company was established in 1921 in New York City, and remained in operation at least into the 1970s. Fig. 19. Sexauer 8 Inch Wrench Pliers, with Insets for Side View and Marking Detail, ca. 1930s to 1940s. Fig. 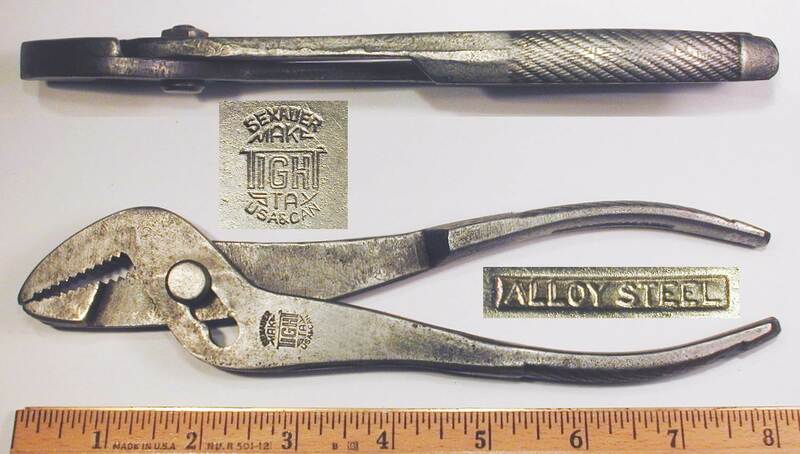 19 shows a pair of Sexauer 8 inch wrench pliers, stamped with "Sexauer" and a "Make Tight Stax" logo, with "USA&CAN" below. The handles are also marked with "Alloy Steel" forged into the undersides. The overall length is 8.3 inches, and the finish is cadmium plating. These pliers are very similar to the Wilde 8 Inch Wrench Pliers shown in a previous figure.